Prepare your whole body, all of your senses, and warn your immediate family, because Robo Vampire is an experience out of this world. 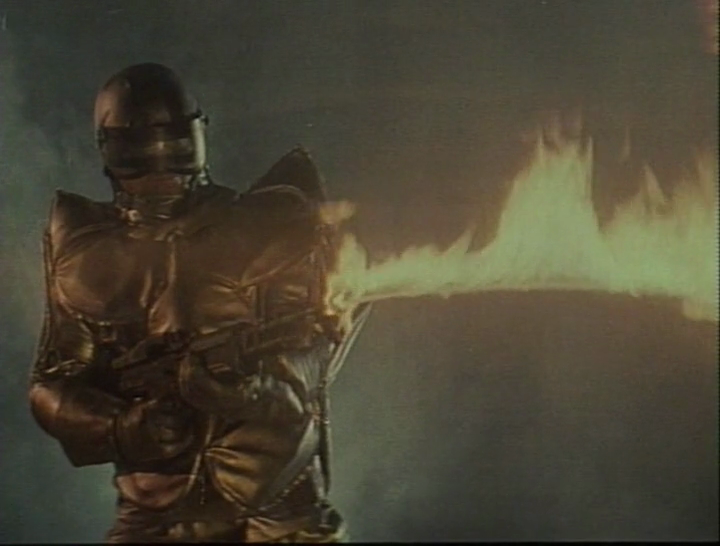 It features a trash can RoboCop, brought to life in Hong Kong to fight a minor drug lord and a Chinese wizard who controls jumping, flipping, smoke breathing, firework shooting, immortal vampires. Take that and throw in half an hour of Thai (I think) mercenaries recovering prisoners from evil dudes, the kind who throw jumbo cartons of eggs on the ground for no reason. This is the film you never knew you wanted, and after you’ve seen it you still won’t want it, but you’ll never want to look away. 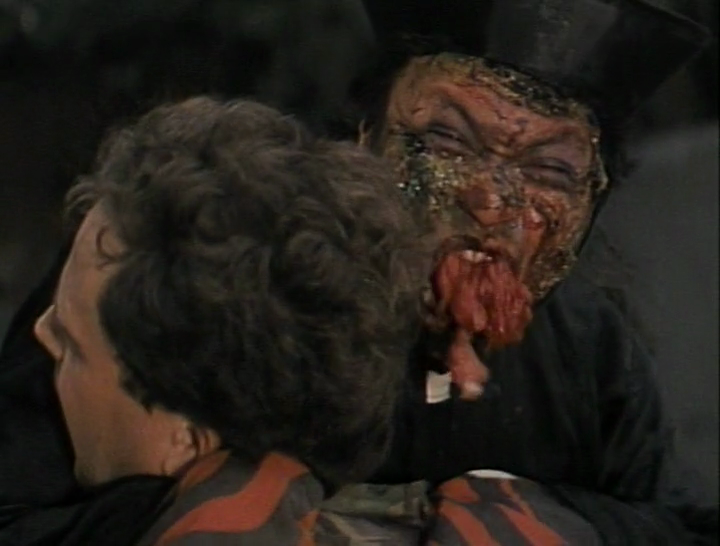 The sheer absurdity at work in Robo Vampire is at once enthralling and repulsive. The whole time I wondered why the movie was just stringing together totally disparate scenes – I’m talking different settings and different characters – with no connection between events, and no narrative explanation. All I knew was that the silly, overdubbed dialogue was supposed to be conveying some sort of story. When it came to the end I found myself just yelling “what” repeatedly. What had I just experienced? What was the deal with the two storylines, and what even happened in either of them? What kind of mad genius would make such a fantastic, low budget disaster? The answer, it turns out, is Godfrey Ho. While that name may not mean anything to most, and indeed he’s under a pseudonym here as he was on many of his 100+ films, he is the premier zero-budget genius of Hong Kong martial arts movies. We’re talking about a guy who knowingly made a career out of being the cheapest, dodgiest filmmaker alive. 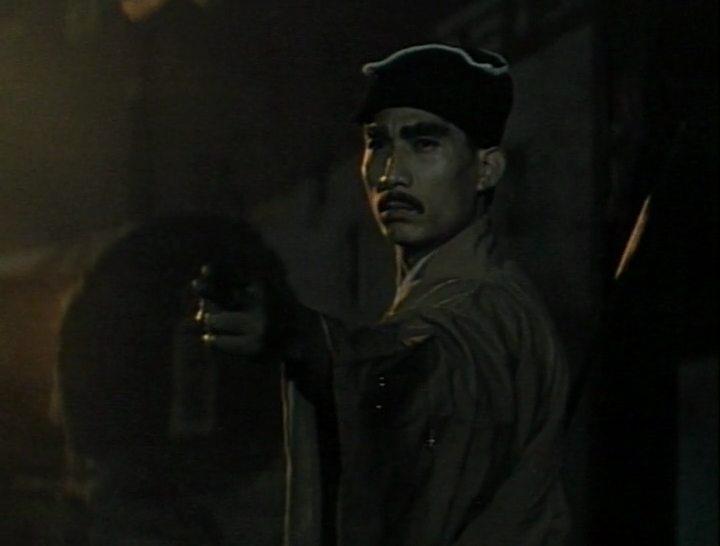 Upon learning more about him I was genuinely impressed – from the late 70s to late 80s he crafted hundreds of films, mostly about ninjas, cobbled together out of footage he shot and various bits of South East Asian action flicks he flogged. The result of his questionable practices, as he rose through the ranks of Hong Kong cinema, is a staggeringly prolific output. He’s made everything from imitation Kung Fu movies made in Korea, to Caucasian ninja pictures spliced into multiple products. There is an argument that it was more his producers, Tomas Tang and Joseph Lai, who forged this picture-stealing style into a business model, but no one seems willing to admit anything. 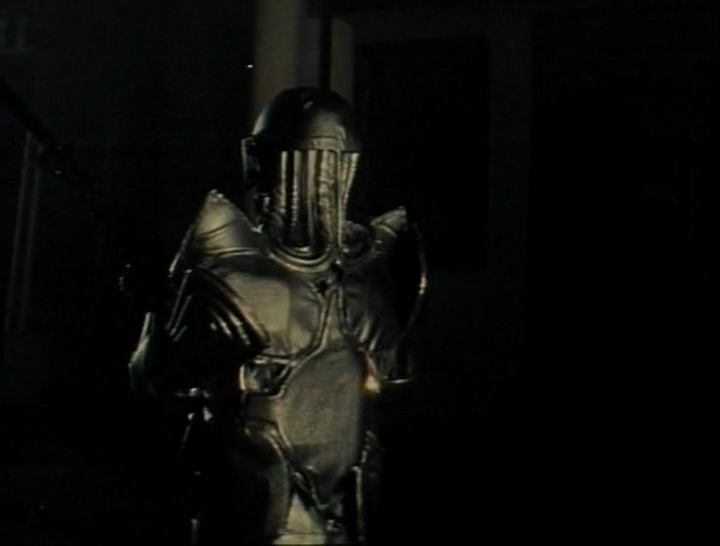 Robo Vampire comes in around the height of Ho’s productivity, but strangely features no ninjas, instead ripping off RoboCop blatantly, and some Hong Kong vampire comedies. The parts of the movie actually made by Ho are bleak and moody, blending tacky, period, Kung Fu flick style with neon lit Sci-fi. The story is supposedly centred around a narcotic agent killed in the line of duty by creepy, jumping vampires, only to be brought back to life as a cyborg in a military lab. I say supposedly because the bulk of the movie seems to have been lifted at least one other, unrelated, probably Thai, action flick. 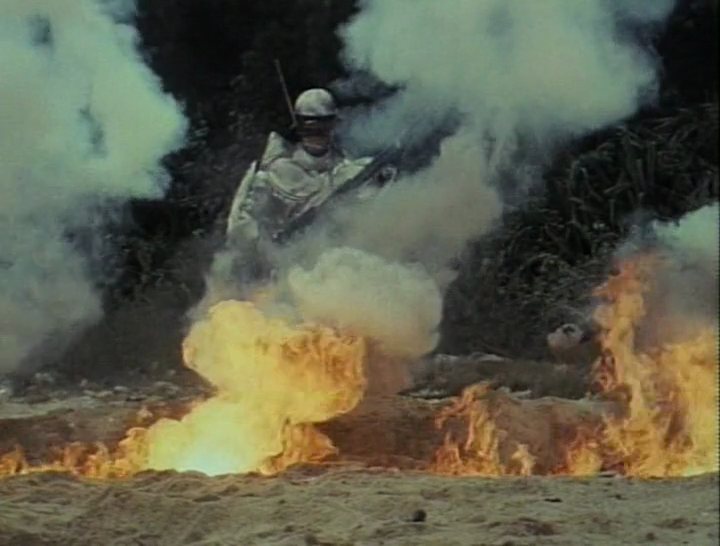 The incomprehensible subplot Ho weaves out of this stolen footage involves mercenaries rescuing a foreign prisoner, and some kind of big shootout. While the whole middle act feels distracting and redundant as a result, it’s not a total loss. It offers some woefully choreographed fight scenes, a lot of shooting, a moustachioed bad guy in a beanie, and a romantic who tells his girl “what a view, you should bathe more often.” It also features actual shots of inserting and stitching bags of cocaine into an Ox corpse. Yeah. While our focus is dragged in and out of the main plot in a disorienting and utterly nonsensical way, the rather key transition of our main man, from narco to cyborg, happens in the space of 2 minutes and about 3 lines of dialogue. 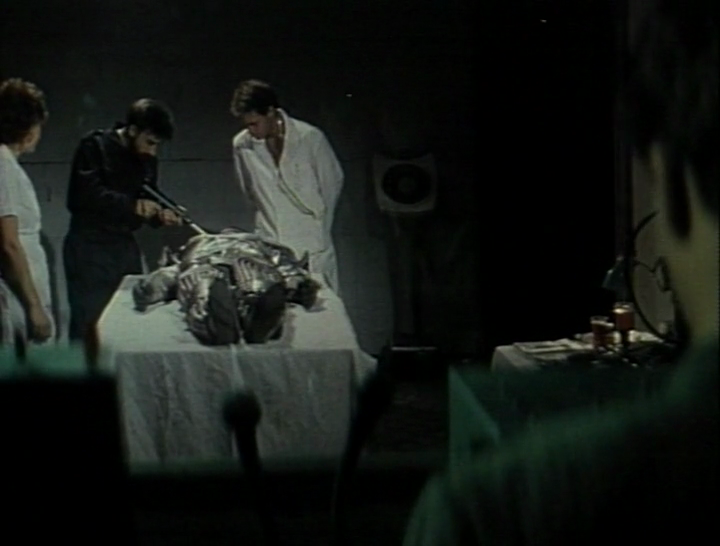 He dies, some guy wants to experiment on his body in a military dungeon, and some 20 year old officer okays it all. Thus our discount RoboCop is born, dressed in some kind of silver, spray painted umpire’s uniform, an off-kilter helmet, and complete with loud, cheesy, mechanical sound effects. His fate, following this sad transformation, is to spend his nights wandering the streets at an excruciatingly slow pace, joints whining with every movement, looking for revenge on the drug smugglers and their wizard friend. He does so, or at least tries to, in a series of long, drawn out action scenes. There was a point where I honestly thought the never-ending series of fight sequences could go on forever, with no one ever accomplishing anything. It was hilarious and pointless. By the way, we have to feel extra sorry for rubbish dump RoboCop, because in a heart wrenching flashback he is dumped by his wife, just for being a cop. I guess she never asked him what he did for a living. 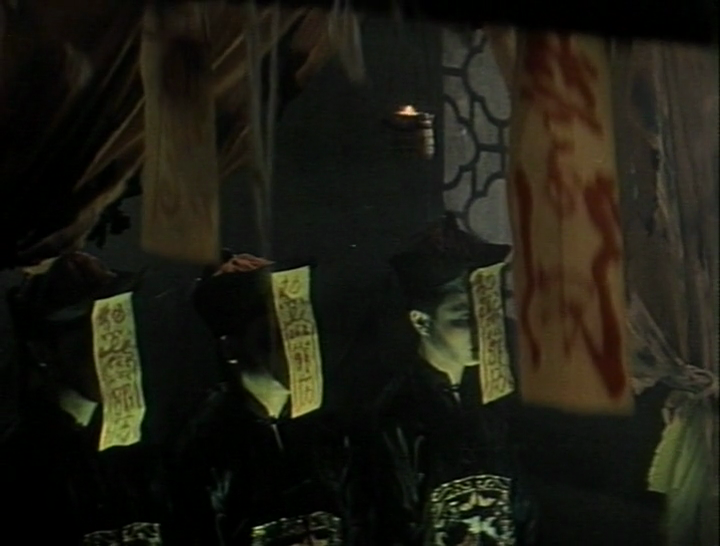 The best element of Robo Vampire is easily the ancient Chinese vampires. The production design on them is the only remotely successful marriage of story and screen in the movie, yet they have unintentional comedic value in spades. 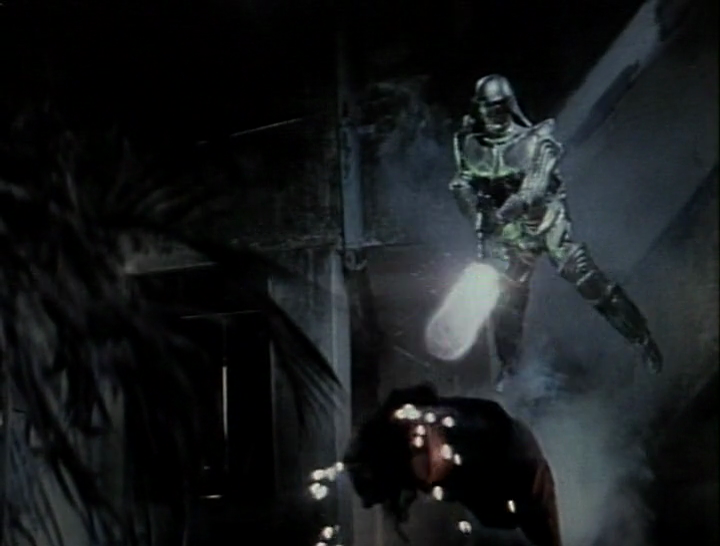 They also have the best action scenes, crazy and on-wires, which are a hell of a good time. I don’t know why they have bubbling, purulent faces, or why they breathe smoke and shoot fireworks, or why they require a ceremony involving a dodgy compass to control, but colour me impressed. 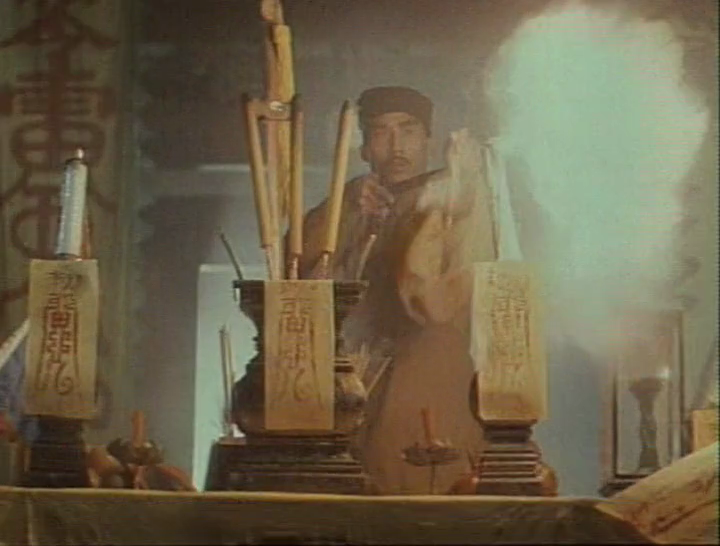 Their wizard master is a total badarse too, and the only person in the movie who is half decent at Kung Fu. The pinnacle of the film involves a vengeful female spirit come to reclaim her gorilla-faced vampire betrothed and consummate their marriage. 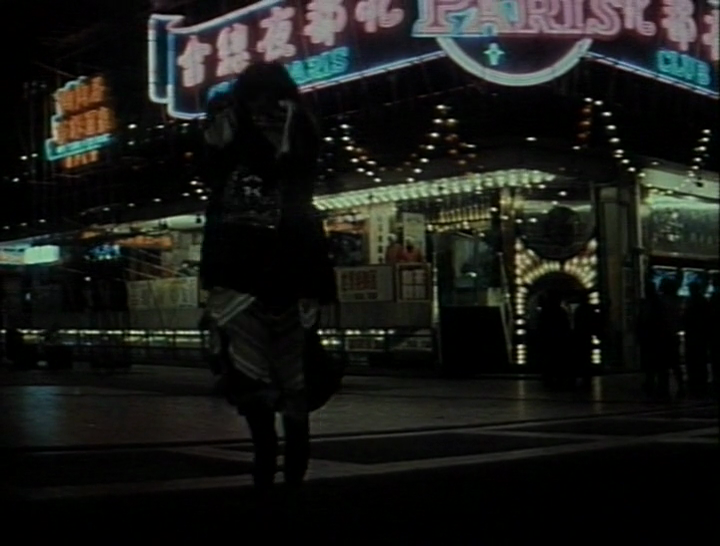 It’s an absolute treat, you have to see the vampire-on-spirit action to believe it. 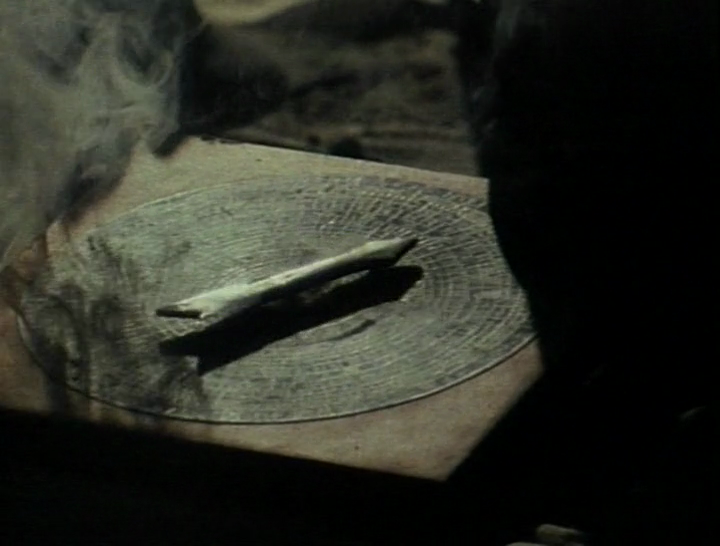 I’ve neglected to talk about the cast and crew on this shambolic production mostly because I have no idea who they are. There are barely any credits to speak of in the film, considering the multiple casts involved. 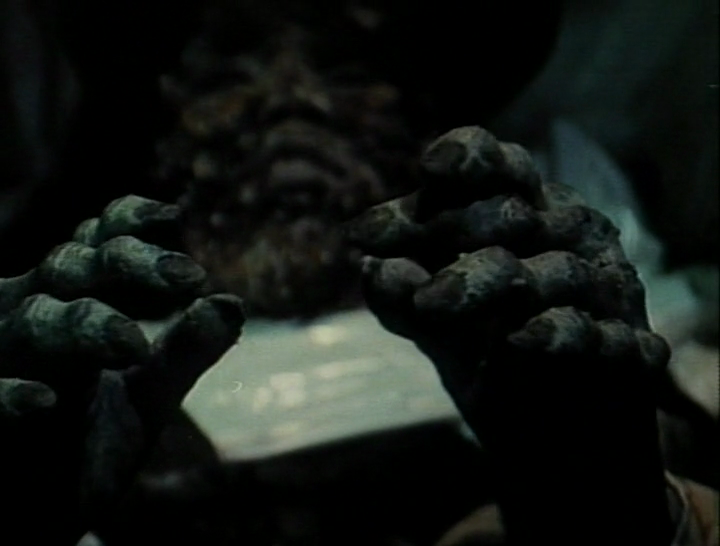 Then there’s at least one other movie’s cast and crew that have been spliced into this mess. 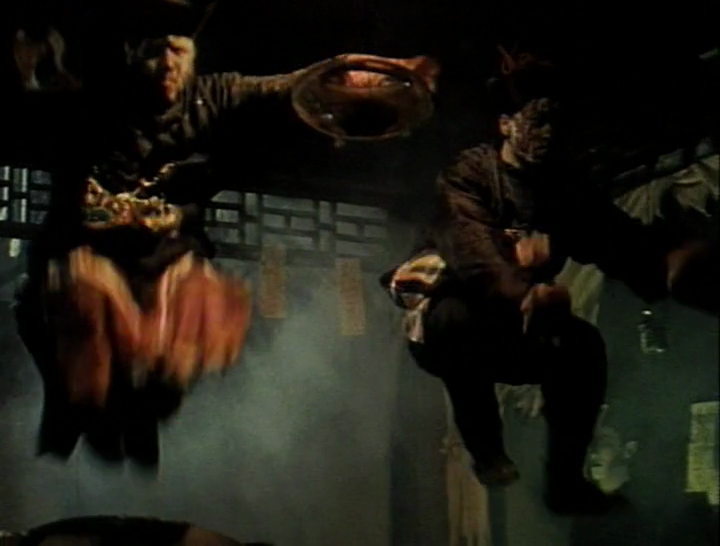 Apparently Ho would grab any white face he could find to fill the leading roles, use Hong Kong stuntmen for the action scenes, steal scenes from other films to fill out the running time, and dub it all together. 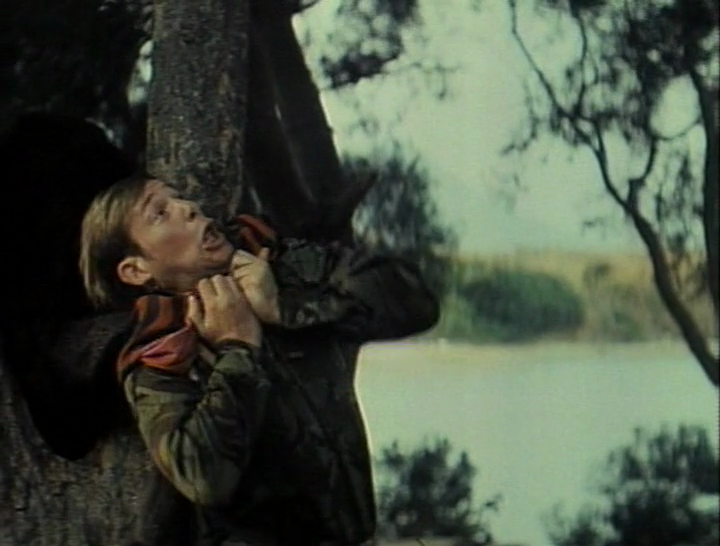 This was both to try and increase international appeal – it seems no one in China wanted to touch his films – and to keep costs as low as possible.The overdub talent on Robo Vampire is impressively awful, although so is the writing and recording, featuring a Howard Cosell impersonator and an incongruous Aussie guy. Props to Ian Wilson though – a guy with one, earlier credit – as he’s crafted a basic but very appropriate synth score. Sadly this music the closest this picture gets to anything resembling art, despite being quite derivative itself. Robo Vampire really is an amazing experience. It’s impossible to tell what level of intention went into the stupidity of it all, and you won’t believe your eyes or ears at times. It’s a zero budget movie, made under questionable circumstances, using potentially criminal methods. It’s a marathon of poorly shot scenes, propped up on dirt cheap special effects, and strung together by a nonexistent narrative. It’s a marvel. The whole package defies belief, and it’ll knock you out with its super combo of terrible production and incomprehensible story. Enjoy.